New and improved High-Performance Membrane brochure is a complete menu of quality roof membrane systems from The Garland Company. This piece will answer valuable questions for architects, design professionals, building owners and facility managers. 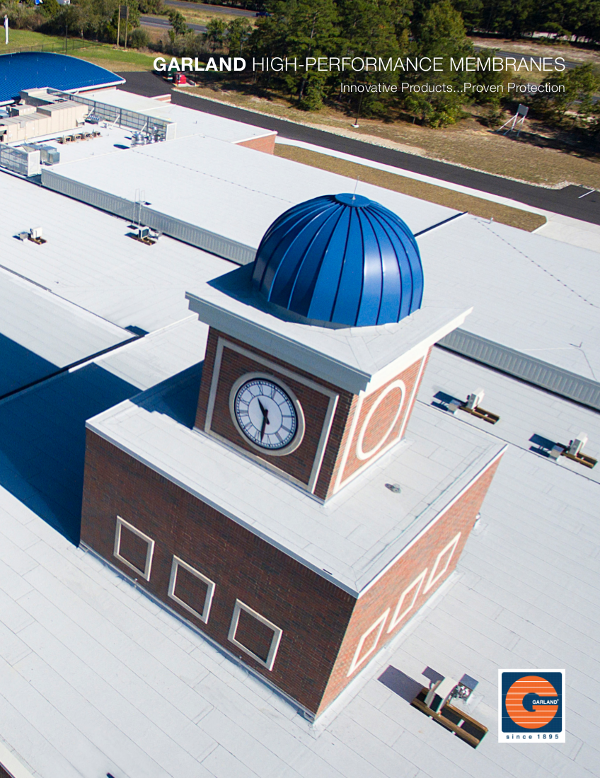 The Garland Company’s line of high-performance roof membrane solutions combines two key factors: cutting-edge innovations and a proven track record of protecting building assets. Backed by a manufacturer who has been in the business for more than 120 years, these products have become synonymous with “value” over the decades. To help customers continue to make informed decisions on the customized roofing solution that is best for their buildings, Garland released a new educational piece – the Garland High-Performance Membranes brochure. The brochure tells the story of Garland’s material offerings, manufacturing history, application options, surfacing options and accessories. The piece even covers what the company considers their very best product, their service. Expect to learn answers to questions like “Why invest in advanced roofing technology?”, “Do Garland products last longer?”, “What application method would work best on my building?”, “How can I customize this roof?” and more. The Garland Company, Inc. is one of the worldwide leaders of quality, high-performance roofing and building envelope solutions for the commercial, industrial and institutional markets. For over 120 years, Garland has continually developed unique product and service offerings that have raised the bar of performance while exceeding the individual needs of customers throughout the world. Today, our network of over 200 local building envelope professionals is strategically positioned throughout the United States, Canada and the United Kingdom to provide quality building envelope solutions for single and multi-property facilities. The Garland Company Inc., headquartered in Cleveland, Ohio, is an ISO 9001:2008 certified company. For more information, visit www.garlandco.com or call 800.321.9336.